March is upon us again, with warmer weather and the fascination over a sort of basketball insanity. While you may still cherish or regret your experience from Valentine’s Day, it’s time to move on and focus on another saintly figure. Saint Patrick was credited with bringing Christianity to Ireland and delivering assistance to the people. While this holiday has evolved to describe driving snakes out of Ireland and drinking large volumes of green beer, it came from surprising roots that many people simply aren’t aware of. As your go-to brew pub in Minneapolis, The Herkimer is all about celebrating good times with great people and delicious libations. Since 1999, our uptown craft beer pub has worked to become the hub for your entertainment. With a full service bar and delicious food options, you’re sure to find everything you need at the best sports bar and grill in town. We love Saint Patrick’s Day, and our four-dollar specials on ale and shots and delicious confectionary items ensure that you will, too. Today, we’ll highlight a few misconceptions about this holiday that you may be surprised to learn. When you are done, be sure to reserve your table at our pub! While a revered figure in Ireland, Patrick was actually born in Britain (Scotland or Wales, to be slightly more precise) at the end of the fourth century. The son of a Romanized family, he was abducted by raiders and served as a herdsman for years. He eventually escaped, was captured again, then was finally reunited with his family. Is he a revered figure? Yes. Was he Irish? Nay. Despite the fanaticism and pinchin’ surrounding the importance of wearing green on Saint Patrick’s Day, the truth is that Saint Patrick himself was not a fond wearer of the color. In fact, the official color to wear would be “Saint Patrick’s blue,” as this lighter shade was adopted by the Order of St. Patrick in the 1780s. Saint Patrick is said to symbolize the holy trinity with the three-leafed shamrock, making the contest between green and blue a constant struggle. Irish nationalism grew and grew after this point, with green being the mark of Irish pride against British control. Up until 1970, Saint Patrick’s Day was strictly a religious holiday, closing down businesses such as pubs for the day. Once this big day was converted to a national holiday, the pubs were opened and the alcohol was allowed to flow forth. Irish legend posits that our saintly figure wasn’t originally named Patrick. Maewyn Succat was his original name for most of his young life. Upon attaining priesthood, his name was changed to Patricius. It’s funny how small details like this can create such huge changes throughout history! While the details and histories surrounding this holiday can be challenging to sort out, the true spirit of Saint Patrick’s Day lives on worldwide every year. 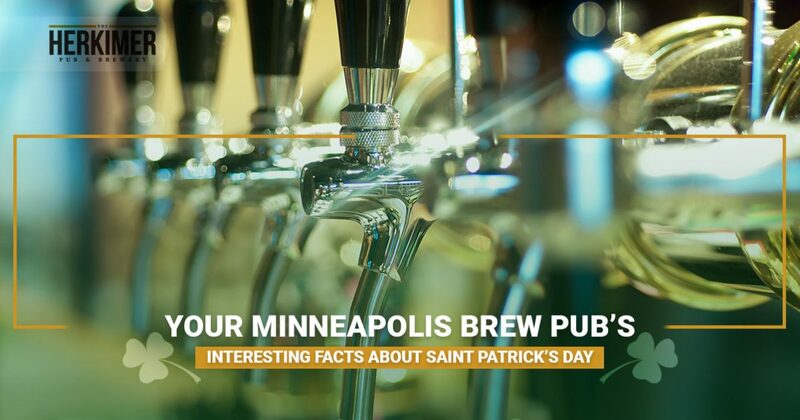 This year, be sure to make the most of your day by stopping by our brew pub in Minneapolis. The Herkimer is proud to be the go-to local brewery bar, delivering small-batch brews and confectionary perfection to ensure that you have the best meal to go with our fun, relaxed atmosphere. Reserve your table today to check out the spot and be sure to stop by on Saturday, March 17th to show your Irish pride with The Herkimer!